Bible study is an excellent way to explore God’s Word and your faith. It is also an outstanding opportunity to create a support group for asking the hard questions of life. Bible study isn’t so much about knowledge (although you certainly receive it) but about wisdom. Childcare is available upon request. Also visit Sunday School for additional study choices. Ok bad girls…you know who you are. It’s time to get IN the Bible! During our first session we will be studying the book, Mud and the Masterpiece by John Burke. This engaging study will discuss Jesus’s encounters with imperfect people with inspiring stories of ordinary Christians having Christlike impact, so we can be encouraged to see the masterpiece beneath the mud in everyone. It shows how to align our hearts with the heart of God and our actions with the interactions of Jesus in order to show God’s love to a hurting, broken world. Learn and discuss the basics of the bible and bible study. You are invited to attend one or all classes in the series, which will connect together, but can also stand alone as independent sessions. This ongoing study reviews the lectionary scripture for the upcoming Sunday service. All are invited to attend! The Ladies’ Morning Bible Study is starting up again for the new year and will begin their first study with Unveiling Mary Magdalene by Liz Curtis Higgs. Three 8-episode segments each explore a different aspect of Covenant life. Each will examine what Covenant means, and the progression of a Covenant relationship with God. Learn more at Covenant Bible Study. DISCIPLE is a program of disciplined Bible study aimed at developing strong Christian leaders. The study gives the Old and New Testa­ments equal time emphasizing the wholeness of the Bible as a revelation of God. DISCIPLE draws upon the work of scholars, the personal Bible reading and study of the participant, and dynamic group discussion to aid understanding of the Bible. The first study in the program is DISCIPLE: Becoming Disciples through Bible Study. It serves as the basis for all other studies in the DISCIPLE family that follow. Over the course of 34 weeks, the study covers the entire Bible (Old and New Testaments) following the biblical story from Creation to the New Jerusalem. 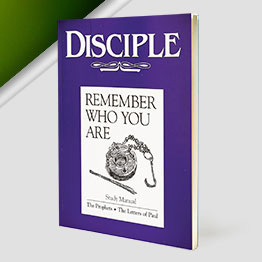 DISCIPLE: REMEMBER WHO YOU ARE is part of the four-phase DISCIPLE program and is prepared for those who have completed BECOMING DISCIPLES THROUGH BIBLE STUDY.The driving idea in this study is the connection between memory and identity as the people of God. The word You in the title is meant to be heard both in its singular form (the individual) and its plural form (the community). We are a community of memory. Participants in this thirty – two week study will read the major and minor Old Testament prophets, with the exception of Daniel, and will read the thirteen Letters traditionally attributed to Paul. To establish the historical context in which the prophets spoke for God, daily reading assignments draw also on the books of Deuteronomy through Chronicles. Several themes weave their way through the study – the call to remember; the call to repentance; the need for renewed vision; and the place of community. The prophets and Paul are continually calling hearers and readers back to their God and to a sense of who they are as a people “set apart”.